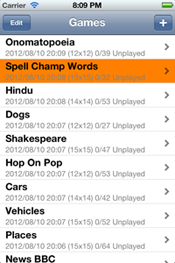 Word-A-Maze is an amazing word search type puzzle creator and game for the iPhone and iPad. It allows you to create unlimited puzzles from your own words or provided wordsets with a secret message in every puzzle! Word-A-Maze is the only IOS word search puzzle with secret messages. It is also the only word search puzzle with ability to enter your own words and/or secret message to create a personal puzzle. It also uniquely delivers unlimited number of puzzles. All for less than a buck! 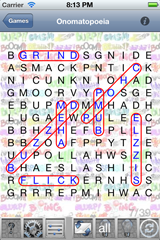 It creates a new personalized word search puzzle each and every time! Once all the words are found, only your personalized secret message will remain and be displayed!All puzzles are saved and marked as Unplayed, Started or Solved. Creation date, puzzle size, title and number of words are all indicated. Any puzzle can then be replayed or continued where left off. Three typical puzzles are provided as samples upon initial use of the game. Any puzzle can be deleted, modified, emailed or restarted at any time. For new puzzle creation, an internet connection is required. Existing puzzles can be replayed even if locked in a lead closet. If going on a trip abroad and you don't enjoy all those wonderful roaming data charges, we recommend you stock up on lots of Word-A-Maze puzzles before departure!! Title - You may personalize the title of any puzzle, otherwise a default title will be provided. Puzzle Size - For the iPhone puzzle grid sizes are from 10x10 up to 15x15. For the iPad you may choose from 10x10 up to 25x25. Default size is 12x12 (iPhone) or 15x15 (iPad). Secret Message - You may enter your own personalized secret message. If one is not entered, a random default message will be used. You may either use your own words or one of the many wordsets provided. If no wordset is chosen, a random set is used. To add your own words spin the selector to 'Use Personal Wordset'. It is recommended that you either type the words in the provided area or better yet paste words using the iPhone/iPad cut/paste functionality. If your own words are used, the more words the better. For best results, use as many words as 10x the grid size. For example, for a 15x15 puzzle, use at least 150 words. If a puzzle cannot be built perfectly, you may try again with more words or a smaller grid size. For a given puzzle size, the app will automatically pad out any puzzle where you provide an insufficient numbers of words. It will use basic vocabulary words to fill out the puzzle. Not all words in your wordset may necessarily appear in the puzzle. Only words that are 3 characters or greater are used in any puzzle. In the case of provided wordsets, the harder wordsets may be marked with asterisks. It may vary from * Hard to *** Super Hard. The difficulty can be based on varying factors: foreign language, strange spellings, difficult spellings, and confusing word nestings. All "News" wordsets are grabbed from the headlines at time of your puzzle creation. Not all wordsets are available at larger grid sizes. This is why some wordsets may be "lighted out" on the spinner/selector for large grid sizes. Users are welcome to email us their own wordsets. If it is suitable for play, we will add it to our program. It will then be immediately available to all users. A user may denote keywords that may be added to any existing wordset. These keywords are guaranteed to be present in the puzzle. This allows users to personalize any wordset! When a word set is chosen with the spinner/picker, a dialog enter box is presented stating "User Defined Keyboards". All your "keywords" entered here before you "Generate New Game" will be in your personalized puzzle. Only keywords that are 3 characters or greater are used in the puzzles. Occasionally puzzles may fail for very large puzzles, such as those with a grid size of greater that 20x20. It is rare with preselected wordsets, but in those cases the created puzzle will have a repeated secret message. If so you can also use the modification button to redo or simply create a new puzzle. Usually in the rare case of a failure, the puzzle is made as normal, but with a secret message that may partially repeat. The puzzle appears on two or more pages, one containing the puzzle grid and the other the puzzle words. A simple finger swipes moves the users back and forth. To select a word, touch the first, and then last letters of the word (or vice versa). If it is a valid puzzle word, the word is circled on the puzzle page and the word is crossed off on the word page. The number of words selected/total appears in the puzzle title. When the last word is selected the secret message is displayed! Words may recur as part of other words (due to the existence of compound words or plurality). In these cases you will need to find the original word. Letters or Numbers (no special characters are accepted) may be used in the wordsets or secret messages. Backward - Allows you to cycle backwards through all your games. Help - Shows/Hides help page. Resize - Resizes the puzzle grid (50, 75 or 100%). Settings - Options to change background. Modification - Allows you to modify an existing puzzle. Upper/Lower case - Change case of font of puzzle grid. Email - Allows you to email the current puzzle (in a unplayed state). Hint - Reveals the next (alphabetically) hidden word in the puzzle. Restart - Clears all found words and allows you to start again. Forward - Allows you to cycle forward through all your games. Once a letter in the grid is selected (touched), users can request a 'hint' by double-tapping the letter again. This will highlight all the letters in the puzzle containing that letter. If the user touches the letter again, the character will no longer be highlighted in the grid. Users may also request the next hidden word (alphabetically) to be revealed by touching the 'light bulb' button in the lower button bar. A hint all is provided to immediate solve the puzzle and show the secret message. The puzzle may then be restarted with the restart icon in the bottom toolbar. Background -The user has a choice of more than 130 backgrounds. The default background is "bathroom tile". Backgrounds may be changed using the picker in settings. Found Word Colour - Can be black or the default blue. Word Alignment - Words can be aligned on the word pages with a Left, Centre or Right justification. Left justified is the default. Word Display - Words can be showed on the word pages forward or reversed. Forward is default. Reserve can help in solving the puzzle or make a puzzle more challenging. Sound - Sound can be turned off. It is normally on. Any puzzle may be emailed to anyone. 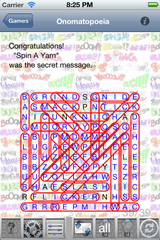 The user may send an email with a greeting message and a link to the puzzle. The puzzle will be in an unplayed state. The user may then print out or play the puzzle at their leisure. Hopefully you choose a good "Secret Message"! This app is a collaboration written & designed by Arctic Surf Designs and Associates. We are comprised of ex-Bell Northern Research (BNR/Nortel) designers: Jeff B., Julie M. and Richard S. (Fred). We have years of fun experience in all kinds of real-time software design. This particular app is written using primarily Object Oriented C and Perl. Small print - We are not responsible for any content of any wordset or "Secret Message". You should not, but if you do find any content offensive, let us know and we will review. Word-A-Maze is fully biodegradable. If left on the screen, it will eventually dissolve into nothingness, leaving no toxic residue or ecological footprint. Each time Word-A-Maze is used, it contributes to global warming, equivalent to a value of less than the flap of a butterfly's wing. Word-A-Maze helps all the starving people (and over population) in the world by freeing up some of the worlds food supply, a result of keeping users busy playing games and not eating (and doing other things)! Thus we recommend this puzzle not be played while eating. We also only recommend that you only drink water while playing, if living in a water rich country such as Canada or Finland.